Raised peripheral resistance is a standard finding in patients with arterial hypertension and would account for the level of pressure at least in the chronic state. The mechanism for the increase in resistance remains obscure. Most theories have assumed that the vessels are constricted in response to disordered outside influences. Suggestions have included increased concentrations of the circulating constrictor substances adrenaline, noradrenaline, angiotensin II or the more recently described Na+-K+-ATPase inhibitor (de Wardener & MacGregor 1982). Alternatively increased levels of sympathetic nerve activity may be responsible, either because of some altered central mechanism, or because of altered peripheral control of mediator release (Brown & Macquin 1981). 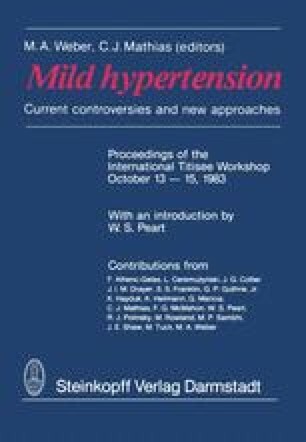 Some theories have considered that the abnormality may lie in the smooth muscle itself, and one popular hypothesis proposes that, at least in the chronic state, hypertension is maintained simply as a result of the physical bulk of the smooth muscle (Folkow 1978). Another hypothesis suggests that the smooth muscle has some specific abnormality of calcium handling (Robinson et al. 1982).